John R. “Johnny” Cash was born in Kingsland, Arkansas, in 1932. At the age of five he started working with his sharecropping parents and siblings in the cotton fields. During his childhood his family home was flooded twice. He began singing and playing guitar by the age of 12. He moved to Detroit in his late teens for work. He was drafted and served in the U.S. Air Force as a Morse Code Intercept Operator for Soviet Army transmissions at a base in Germany from 1950 to 1954. When he was discharged from the military he and his new wife, Liberto, moved to Memphis. Cash worked as an appliance salesman while trying to get a break in the music industry. Cash got to audition with Sun Records in 1954. He had his first charting single on the Billboard Country charts in 1955 titled “Cry! Cry! Cry!” Subsequently single releases, “So Doggone Lonesome” and “I Walk The Line” climbed to #4 and #1 on the Country charts. The latter hit also was his first debut on the Billboard pop charts where it made it to #17 in 1956. By the end of the 1950’s Johnny Cash was a household name. Cash appeared on The Ed Sullivan Show, The Tonight Show Starring Johnny Carson and other variety shows. He managed to chart five singles to the #1 spot on the Billboard Country charts. Two of these, “Ballad of a Teenage Queen” and “Guess Things Happen That Way”, were his most notable pop crossovers, besides “I Walk The Line”. By the time Cash released “The Rebel – Johnny Yuma” he had thirteen Top Ten country hits in the USA, though no Top Ten hits on the Billboard Hot 100. “The Rebel – Johnny Yuma” was the third Top Ten hit for Johnny Cash from September 1956 into the early 60’s. “The Rebel – Johnny Yuma” was part of the wild west motif, iconic for American males to emulate. Cash had appeared in an episode of Shotgun Slade in 1959 and Wagon Train the same year. In 1961 he appeared in The Deputy, a TV show about a deputy who is also storekeeper who only used his gun reluctantly to confront criminals. His follow single to “The Rebel – Johnny Yuma” was “Tall Men”. “Tall Man” was written by Ken Darby. He was the vocal for the Mayor of Munchkinland in the 1939 film, Wizard of Oz. From 1940 to 1953, Darby was one of the featured vocalists on the radio show Fibber McGee and Molly. He was also one of the voices on the animated cartoons of Tom and Jerry. In 1946, Ken Darby was the choral and vocal director for the Walt Disney animated film, Song of the South. The film produced a big hit that year titled “Zip-A-Dee-Doo-Dah”. In the mid-50’s, Ken Darby was the vocal coach for Marilyn Monroe on both Gentlemen Prefer Blondes and There’s No Business Like Show Business. Ken Darby is best known for his work scoring musicals in Hollywood. He won Academy Awards for Best Scoring of a Musical Picture in 1956 for The King And I, in 1958 for South Pacific, in 1959 for Porgy And Bess and in 1961 for the Flower Drum Song. Darby also won best score oscars in 1963 for How The West Was Won and in 1967 for Camelot. Ken Darby also scored the 1956 film, Love Me Tender, and composed the title track. However, credit for the composition was given to his wife and Elvis Presley. In 1960, a TV series titled, The Tall Man, had a two year run. The plot concerned the rivalry between Sheriff Pat Garrett and Billy the Kid. One might think that Johnny Cash’s “Tall Men” was from the TV series. But it was actually from a 1955 20th Century Fox film titled “Tall Men”. Starring Clark Gable and Jane Russell, the film was about a cattle drive from Texas to Montana after the Civil War. The song itself concerns a man who is nervous when he is around women, even though his job, herding steers, is pretty demanding. There is one gal who is “sitting in a kiss tree.” However, he tries his best to surprise his desires for her whenever he passes by. In 1961, Johnny Cash also starred in a crime film titled Five Minutes to Live. He later starred in a western in 1971 called A Gunfight. During the cultivation of his outlaw image, Johnny Cash was on a downward spiral starting in 1958 where for nine years he abused drugs and alcohol. His addiction to drugs and alcohol was owed, in part, to a schedule of up to 300 concerts a year for many years. The hectic pace was very stressful. He was arrested in 1965 for trying to smuggle amphetamines over the Mexican border in his guitar case. He was given a suspended sentence and fined. His struggles with drugs and alcohol led to divorce in 1966. By 1968 Johnny Cash was pulling his life back together and recorded a live album in a jail called At Folsom Prison. Cash had a #2 hit in 1969 titled “A Boy Named Sue”, which received the Country Music Song of the Year award from the Country Music Association. As well, he received the Best Country Male Vocal for the song in 1970 at the Grammy Awards. 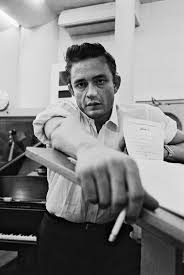 Cash also won a Grammy Award that year for Best Album Notes for his text for Bob Dylan’s Nashville Skyline. In the fall of 1969 he hosted The Johnny Cash Show on ABC TV for two years. He used the show to explore controversial issues like the plight of the American Indian, prison reform and the conflict in Vietnam. In 1982 Cash recorded an album with Carl Perkins and Jerry Lee Lewis called The Survivors Live. Each had been part of the Million Dollar Quartet at Sun Records with Elvis Presley on December 4, 1956. In 1986 Cash was joined by Perkins, Lewis and Roy Orbison to recored an album titled Class of ’55. Between 1954 and 2003 Johnny Cash recorded 96 albums and 153 singles. Of these 89 singles made the Top 30 on the Billboard Country singles chart. In 2005 Joaquin Phoenix played the starring role of Johnny Cash in the biopic of the artists tumultuous life. Five Minutes To Live ~ trailer, Sutton Pictures, 1961. The Death of Gray episode, The Rebel, 1959. James Mangold, Director, Walk The Line ~ Trailer, 20th Century Fox, 2005. Ken Darby, 82, Writer of Famous Film Scores, NY Times, January 26, 1992. The Tall Men, 20th Century Fox, 1955, Wikipedia.org.